Is it really just a few days until Christmas? Where has the time gone? I feel so out of sorts and have been so busy with school and girl scout functions I haven't done any holiday baking. Our family is a huge lover of popcorn and eat it quite often. 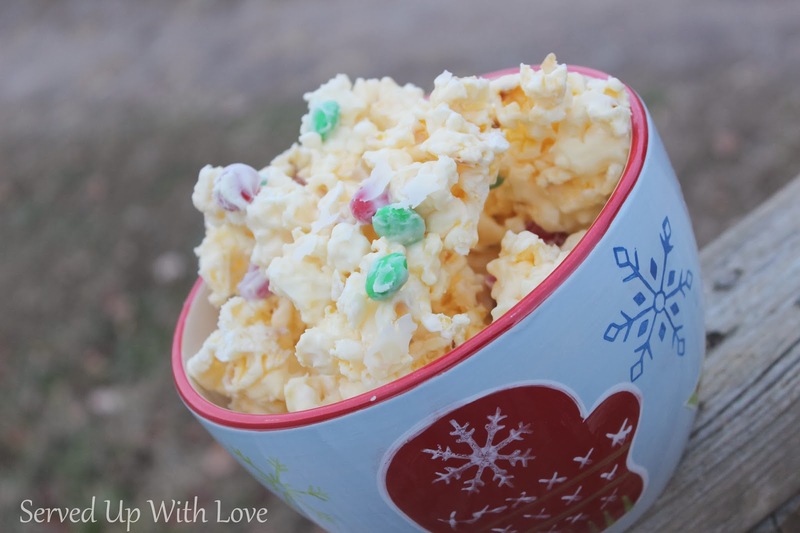 One night I decided to try and do something a little different and make this popcorn crunch. It was a hit. The salty and sweet are such a great combination in this. You just can't eat too much of it at one time. This would be great as last minute gift. Put this in a tin or a cellophane bag and you have an instant Christmas gift. Pop popcorn according to directions on the package, set aside. Melt almond bark in 20 second intervals until melted. Place popcorn in large bowl, pour over melted almond bark and sprinkle in M & M's. Stir until combined. Place on a cookie sheet lined with wax paper until the coating hardens. Break into pieces and enjoy.